Is 2019 the year to switch up your living room decor? If that’s the case, we’ve compiled a list of over 20 living room interior design ideas that our decorators think you’ll find endless inspiration from. Whether you’re into a thoroughly modern living room design or you want something a little more traditional in feel; we’ve got you covered. From simple living room designs to abstract and interesting living room decor ideas, all the hints and tips you need to elevate your living room to the next level, are right here for you to take in. Section your living room using furniture to create a multi-functional and multi-aspect living space. 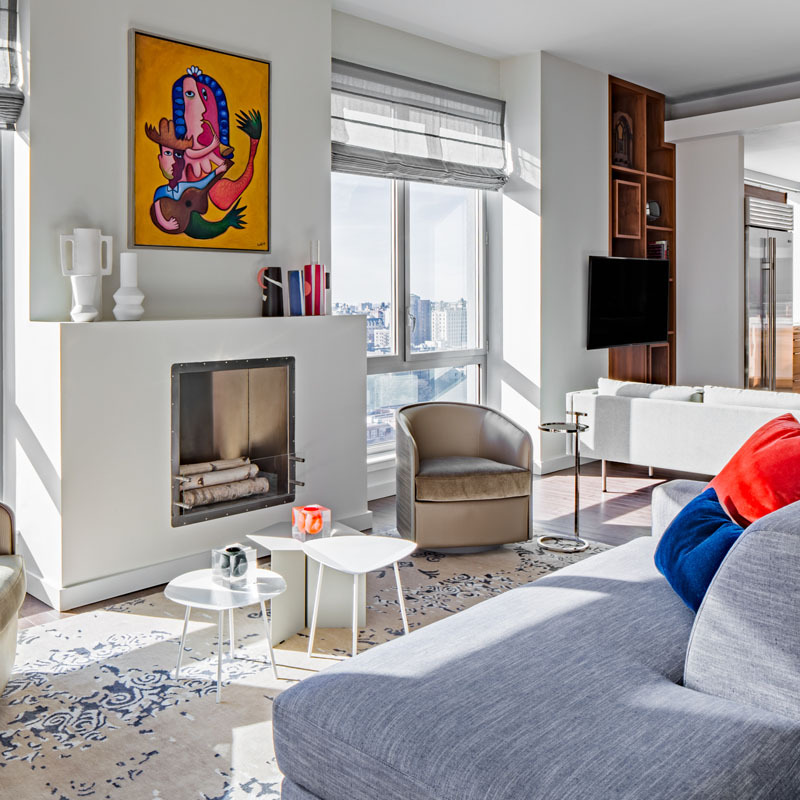 Living room interior design is all about making the best use of the space you have available to you (be it small or large) and sectioning the space with furniture is a great way to do this. A glass coffee table atop a rug, cocooned chair amid a sofa and a couple of comfortable chairs makes for a perfect seating area, closing the space off from your eating area, kids play area or workspace. Living room decor is all about functionality and flow, and compartmentalizing your space is a clever way of achieving both, in a subtle way. Compact side tables are great for freeing up space in a living room while giving you the surface space and functionality you need. Metals are very in right now, and we are seeing a lot of gold, silver, and bronze being worked into the designs, as well as interesting geometric shapes. Metal frame base glass-topped side tables work wonders at opening up space in your living room designs. Dual purpose side tables and sofa consoles enable you to ditch chunky furniture items like bookcases and sideboards in favor of something modern and practical. We don’t need to tell you the benefits of nesting tables – the secret space saving speaks for itself. 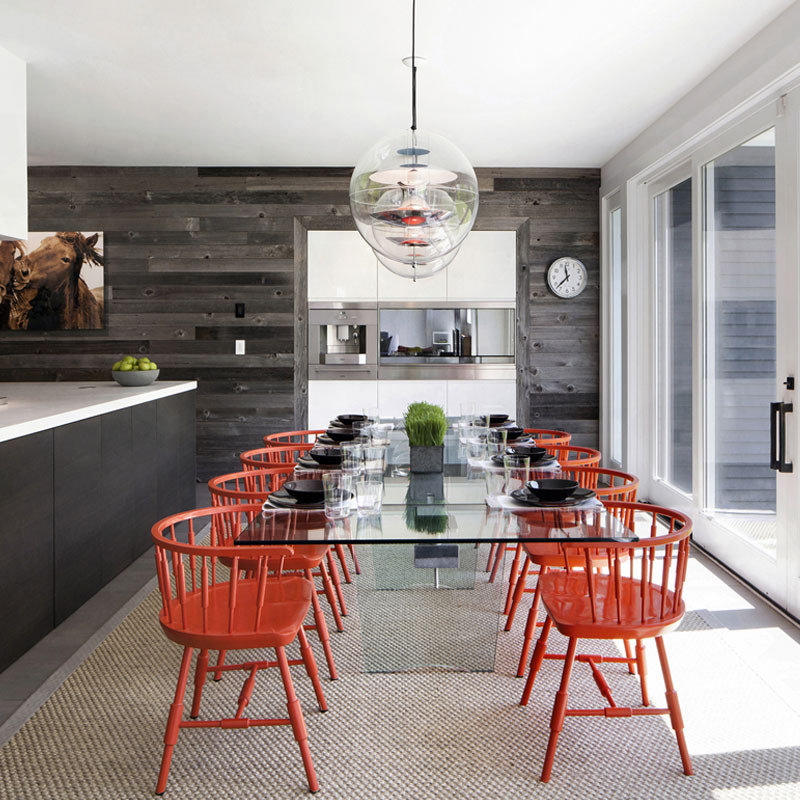 Three tables take up the space of one, but as soon as you have guests around, there is more than enough surface area for cups of coffee and glasses of wine. Our favorite styles at the moment are circular tables with metallic frames, and we’ve seen some hexagonal nesting tables that caught our eye too. For super modern living room decor, how about anthracite nesting tables with a subtle hue to really open up your living room interior? If your living room design isn’t complete without an original piece of furniture to make a statement, then make it with an audacious console table. We can’t get enough of the designs from Hervé Van der Straeten – his use of bronze is like nothing else we’ve seen, and his pieces are truly astounding. 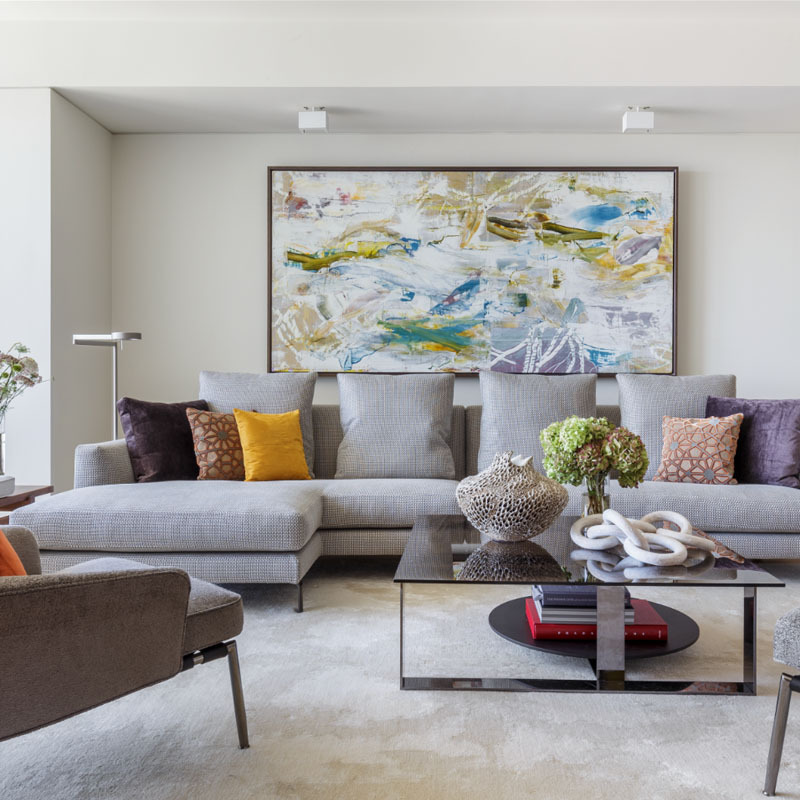 However, if your living room decor budget doesn’t quite stretch to a piece of Hervé, then keep your eyes peeled for console tables with clean, sharp lines, which help bring the abstract into the everyday. 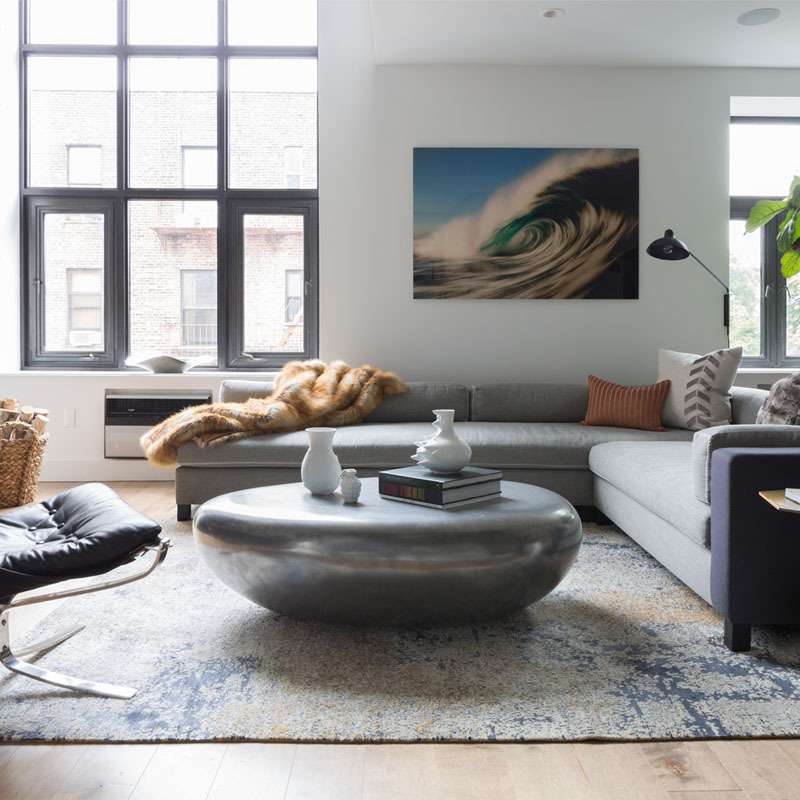 One of the biggest changes in the evolution of interior design is that you don’t have to follow tradition and have a couch in your living room like everyone else does. Be bold, be different. Ditch the classic couch and choose something else, like bench seating, a group of comfy chairs, or a chaise or a settee. An elegant settee will add a regal feel to your living room design, while a set of comfortable chairs will help your living room interior design feel more intimate and cozy. 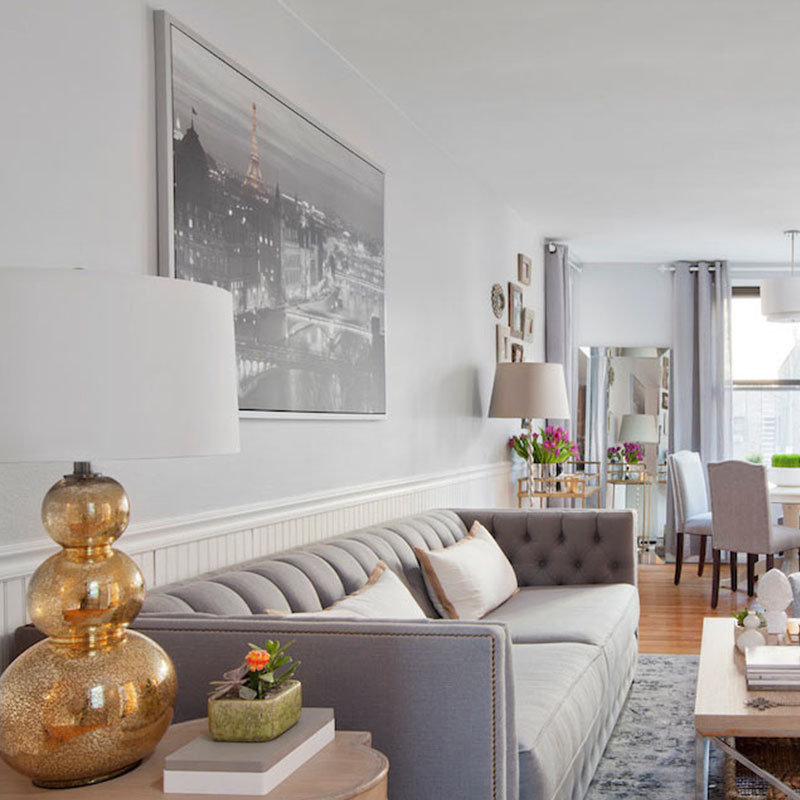 Have your chairs centered around a coffee table to ground your living room, while bench seating is perfect for lounging, or if you aren’t blessed with ample space. We know we keep going on about it, but honestly, the return velvet upholstery is worth talking about. 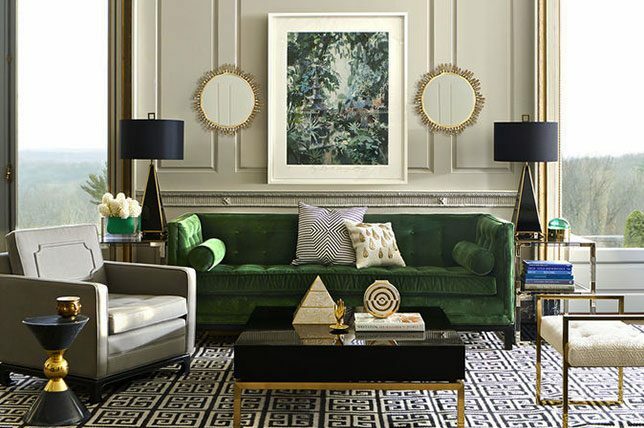 There is nothing you cannot upholster in velvet; from sofas to armchairs, to ottomans, to cushions, and curtains, there is nothing that doesn’t look stunning in velvet. It’s plush and it’s luxurious and it adds a depth to your living room interior design like no other fabric will. We all know that jewel tones are in right now and velvet lends itself perfectly to a strong hue – peacock blue and burnt orange are on top of our living room design lists at the moment. 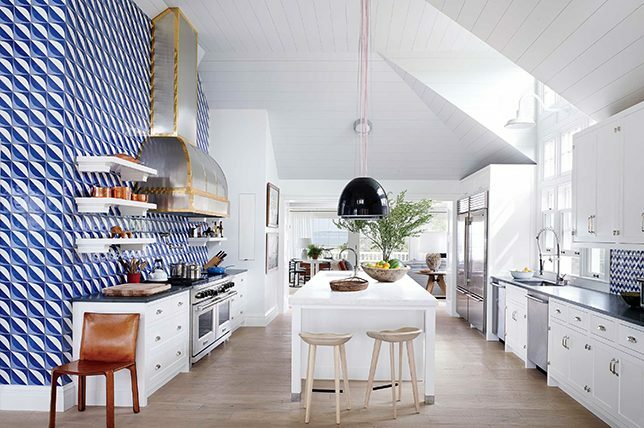 Minimalism is out and maximalism is in; if bare surfaces, a muted color scheme, and limited personality wasn’t for you, then you are in luck. Maximalism is sweeping through living room interior design like never before – think cozy and decadent for your living room decor and use it as an opportunity to showcase cherished treasures while evoking bounce your personality throughout your living room interior. Confuse the senses and test the limits of interior design by ignoring the tired rules of scale in your living room design. Interior design tips for a living room would usually be telling you that the larger your room is, the larger furniture it can accommodate and the smaller your room, the less imposing your pieces should be. It’s time to try something different. Bring in oversized lamps, petite sofas, large chairs, mini nesting tables, and imposing light fittings – mix it up and don’t let your living room decor ideas be stuck in servicing the past. A parlor was always the place where the entertaining was done, and if you are a social butterfly, then parlor-style seating is a great direction to consider. 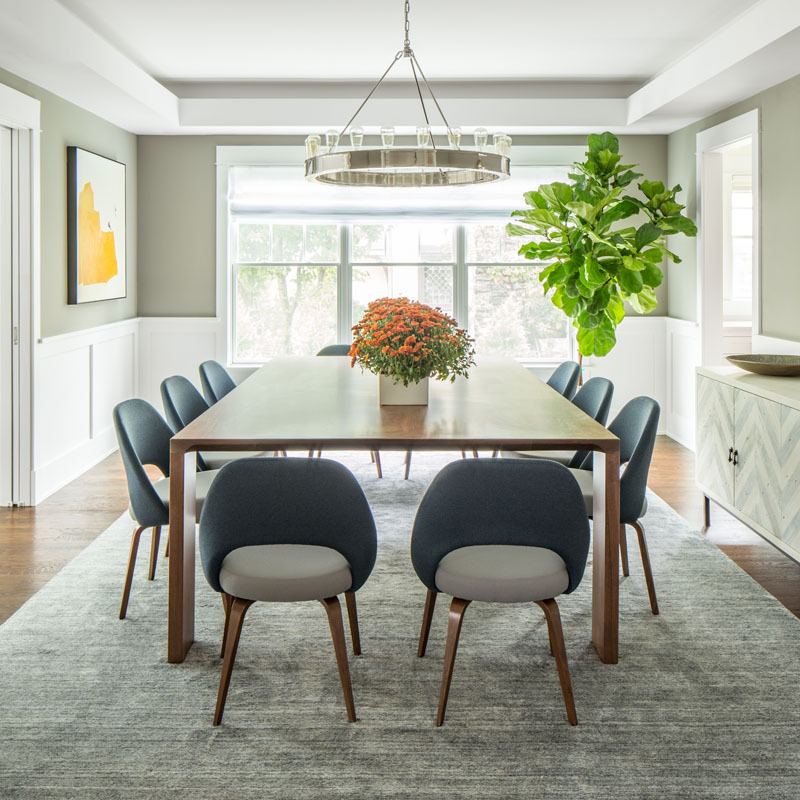 A settee and chairs arranged around a table are guaranteed to make for the best social entertainment space that living room interior design can muster. If you have plenty of space in your living room, you can add a smaller table with a couple of chairs arranged around it in another part of the room. Traditionally, parlor seating would have been a matching set, but we suggest that you introduce different colors and styles of furniture, while still creating a well-judged parlor feel, for a more eclectic living room interior. 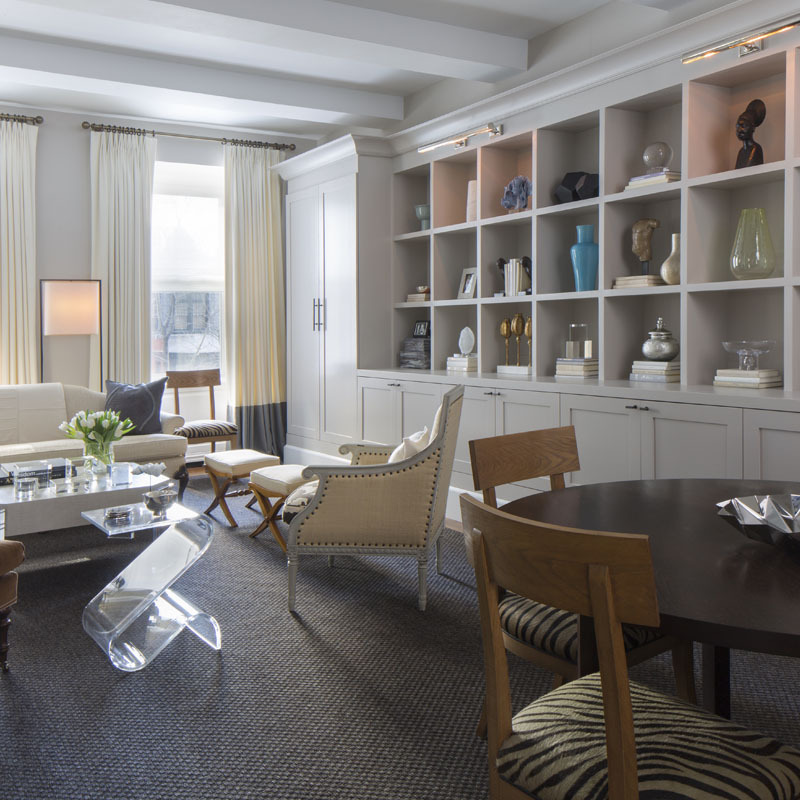 You might have thought that wall lamps and sconces were a thing of the past in living room interior design, but our interior designers keep reporting on new covetable styles and our clients keep asking for lighting options that take the least tablespace. Wall lamps and sconces are back in full force; from modern matte finishes to oversized swing arms to Art Deco-inspired lighting and double sconces, illumination options are taking a remarkably different turn. Far from looking old-fashioned, wall lamps are a smart and chic add-on for a beautifully realized living room design, giving a traditional, yet unexpectedly modern twist to your living room interior lighting. Metals are featuring heavily here, looking great against glossy finishes. 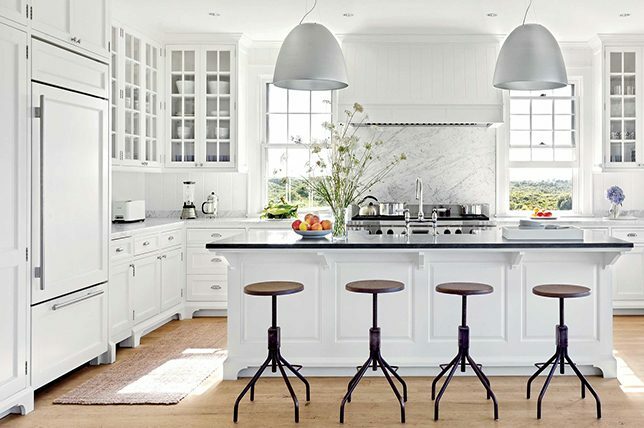 The key for your most seen common spaces should always be exploring routes to make those rooms feel one-of-a-kind. Make your living room interior design all the more memorable and unique with an interestingly shaped chaise lounge that does double duty while adding an enviable sense of comfort and warmth. While they haven’t been in vogue for quite sometime there’s something intriguing about the new mobiles our interior designers have been seeing at industry trade shows the world over since the last couple of years. And when it comes to richly layered and beautifully realized living room decor, a statement-making silhouette is sure to punctuate a room. While the graphic mobile highlighted above is large in scale, when it comes to your own living room decor ideas, you can bring in just about any size mobile you’d like, just be sure that it flows with the rest of the room rather than work as a sight of distraction. When it comes to small living room interior design, going tonal is a great way to make the area appear larger, more defined, and best of all, it makes decorating your living room much easier as there is less room for error. That said, be sure that you opt for a color that is timeless and one that you see yourself admiring for a long while and pair it away with colors relatively close on the color wheel for a rich and dynamic living room. Add some brooding sophistication to your living room decor by introducing darker hues that are easier to keep clean and opt for more intimate, darker lighting to keep the feel cozy and luxurious. Notice how the room featured here though chock full of furnishings in various prints and patterns, would come off as a tad bland due to its very tight color edit without that oversized abstract painting anchoring it. And because everything doesn’t need to match, create a diversified living room interior design by playing with opposites and different elements to make the room pop. We love that the artwork also highlights how traditional the furniture is rather than playing it all down. If you’re short on space or are on the hunt for a totally unique path to beautifully realized living room decor, who says you must have a standard coffee table? As unusual living room decor ideas often make for the most memorable of spaces, skip out on the requisite coffee table and opt for a smart alternative like an easily movable ottoman with plenty of extra storage concealed within it. By now you probably know that every room can use the benefit of mirrors as they make a room instantly feel larger, brighter, and more glamorous. 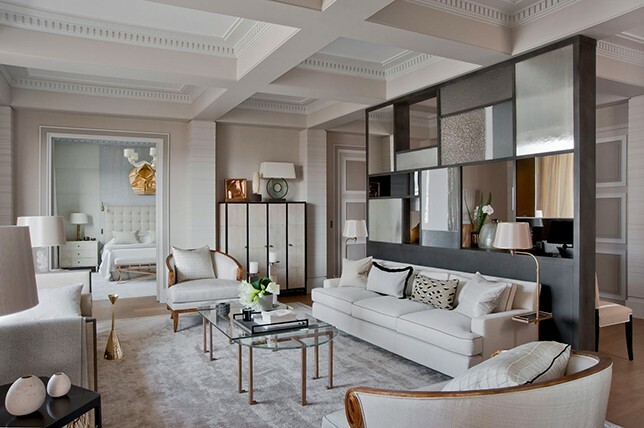 But when it comes to a chic living room design, our interior designers suggest sourcing unique mirrors that will make the room stand out. From mirrored shutters to a mirrored screen, there are plenty of unique mirrors you can bring in that boast a one-of-a-kind feel about them. Sure, the living room interior design pictured above comes off as a tad heavy-handed and busy, but there’s something to be said about the enviable harmony infused throughout to take note of. When it comes to creating a lush living room that feels warm and inviting, stray away from the rigidity often found in showrooms and create layers of furnishings and decor for a truly lived in look. 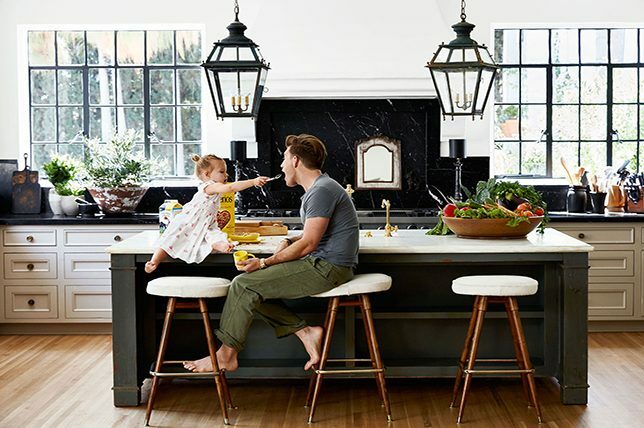 Add a sense of warm maximalism in your living room design by taking cues from the forever-charming Memphis era design movement made popular during the heyday of 80’s maximalism. Think playful silhouettes, exaggerated color, and abstract prints and patterns in small doses to conjure a similar mood and sense of play. Just remember to keep it as modern and stripped down as you can to avoid your living room coming off as inspired by a Taco Bell. When it comes to impeccable living room decor, think outside of the room as well. If you can see inside your living room from other areas in your home think about how they work with one another in terms of design and styling to keep the flow consistent. For another take on living room design that no one else will have, think about not only covering or painting your walls but think about what you can do to make your ceiling make a statement. 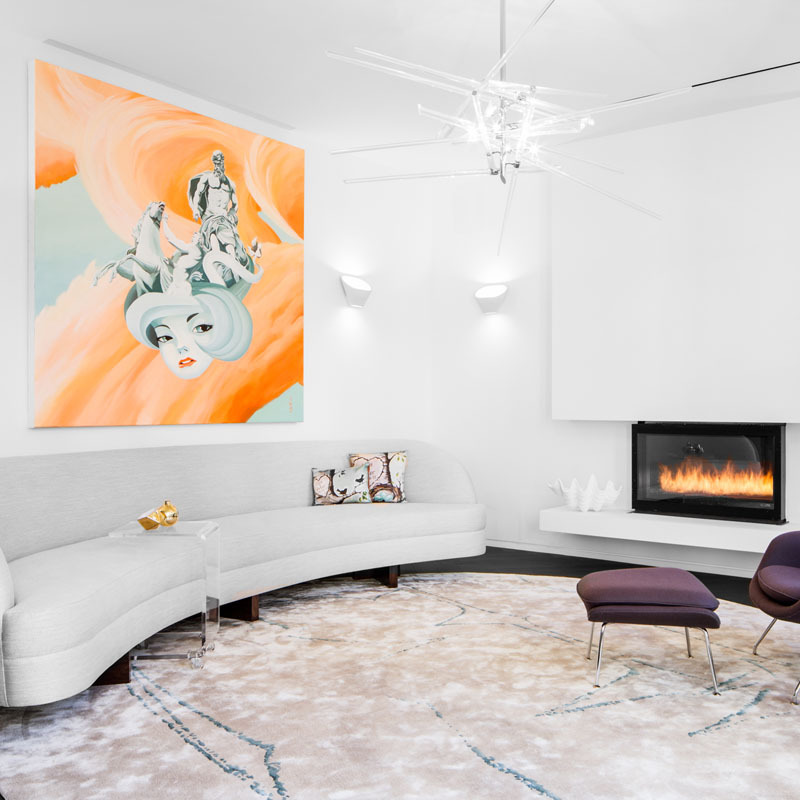 From high-gloss enamel paint to a graphic wall covering, there’s plenty of interesting living room decor ideas to consider as you chart your plan of action. We’ve said it before and we’ll say it again, mirrors are essential in any room, plus they can be sourced affordably to boot. 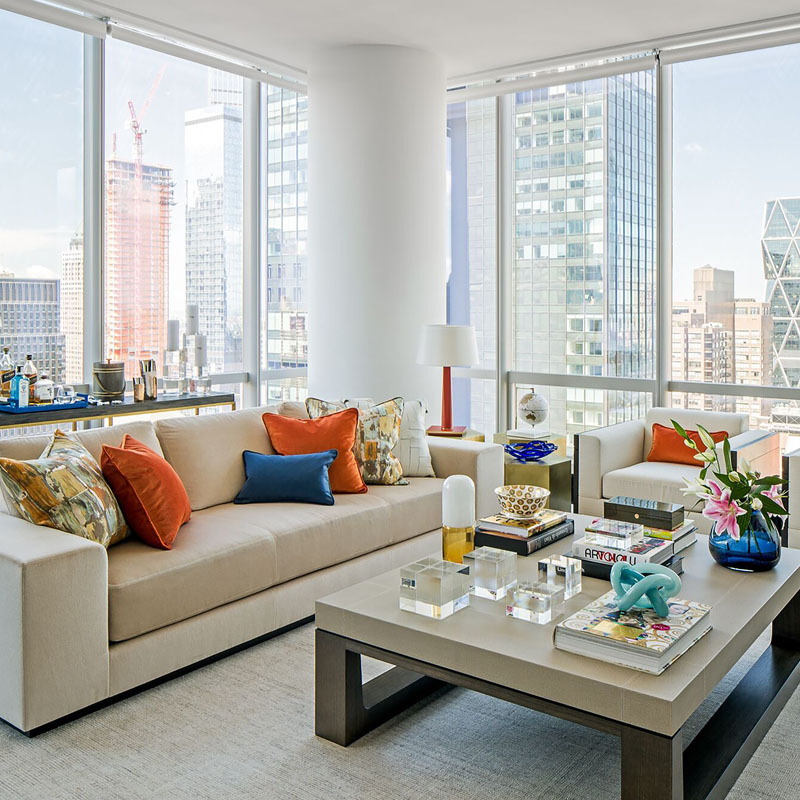 For an elevated living room interior design that’s bouncing with light, bring in as many unique mirrored surfaces as you can for high-shine everyday elegance while making the room appear larger. With minimalism finally starting to lose momentum in the interior design world, explore stylish ways you can add much-needed visual interest in your living room design while making it unique to your home. 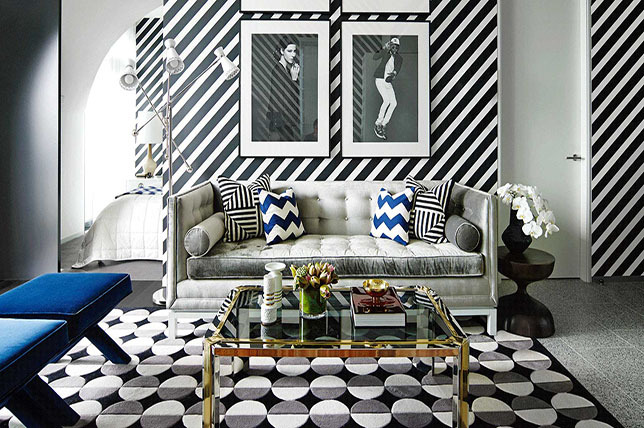 We like the fact that the living room featured above uses a series of two-tone patterns juxtaposed with one another to create a rich and stimulating area that’s full of personality and well-judged elegance. Follow suit by keeping your color palette and print combinations precise for consistency and keep scale in mind as every element should be harmonious with one another, especially in a small living room.